Engine BMC-XSP. 71.5mm bore x 68.2 stroke, capacity 1098cc. Dry sump. Single twin-choke Weber carburettor. Gearbox Citroen-ERSA 6 speed. Rotoflex fixed length, or sliding spline drive shafts. The Hydrolastic suspension having proved unsatisfactory on the T65 prototype testing the brackets were quickly revised and the production run of T67s cars had coil springs. 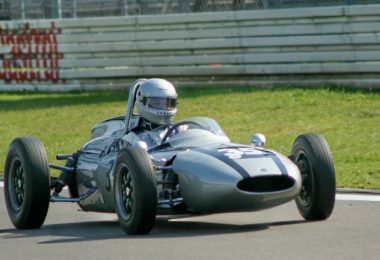 For this last European season of Formula Junior Cooper produced a strikingly low and narrow design similar to the previous years Formula 1 car. 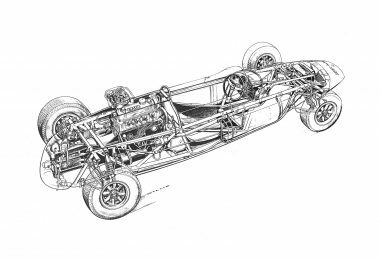 The pencil slim body included a large opening in the tail end, the chassis incorporated anti-dive & anti-squat suspension with a new style of cast magnesium rear upright together with an additional link arm, adjustable via Rose joints. 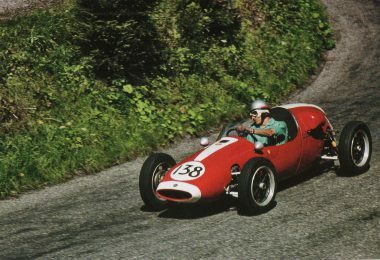 With the formula drawing to a close, sales figures dropped to about half of the previous year and of these only a few cars had the standard BMC engine. A significant number of customers specified the now popular Ford engine and a similar number opted to have their cars delivered without any engine. 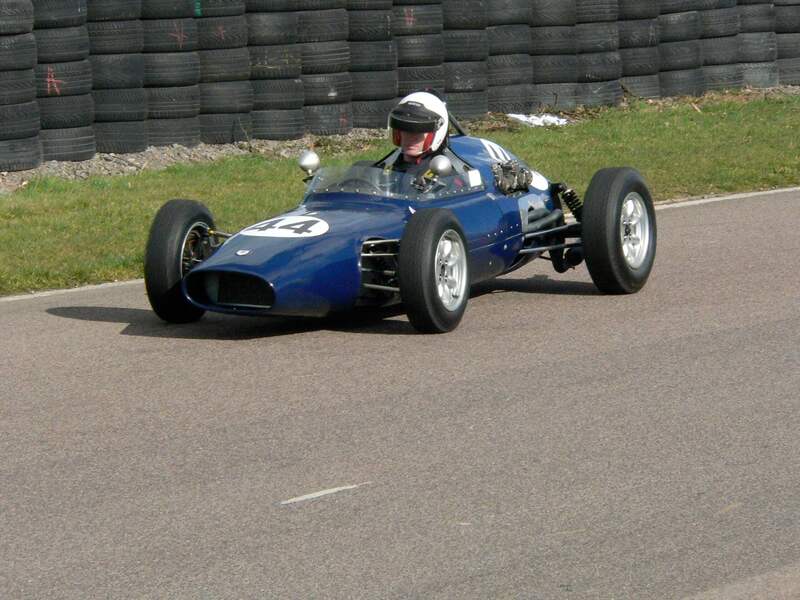 Jack Knight somehow managed to fit 6 speeds into the much modified Citroen-ERSA gearbox to compete with the, now almost industry standard, Hewland. 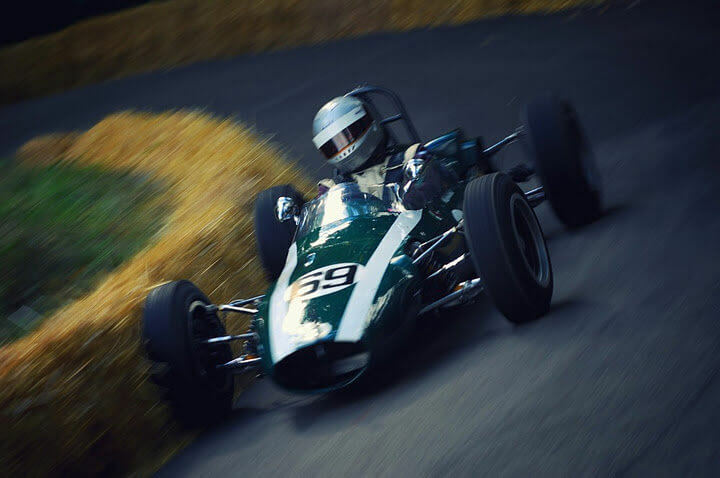 The result of all of this sophistication produced a fast car, and Peter Revson, heir to the Revlon cosmetics fortune, achieved the fastest ever recorded race lap speed for any Formula Junior car with a 130.50 mph lap of Enna-Pergusa. 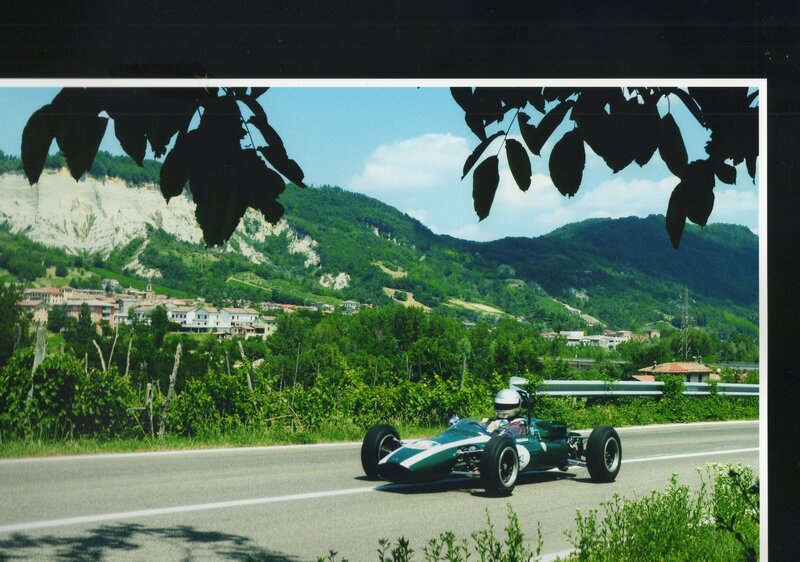 Kurt Bardi-Barry opened the account for this model with a win at Vallelunga followed a week later when the future Formula 1 star Jochen Mass won at Cessenatico. Unfortunately, this promising start did not herald a spectacular season for the model, with just less than 20 race wins across the world. 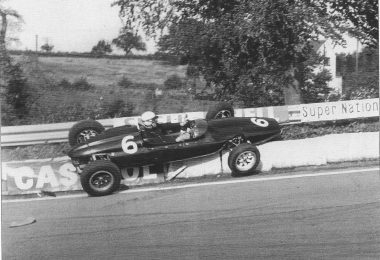 However one man, Kurt Ahrens, notched up an astonishing 9 of these, including once at Budapest in front of an estimated 75,000 spectators. 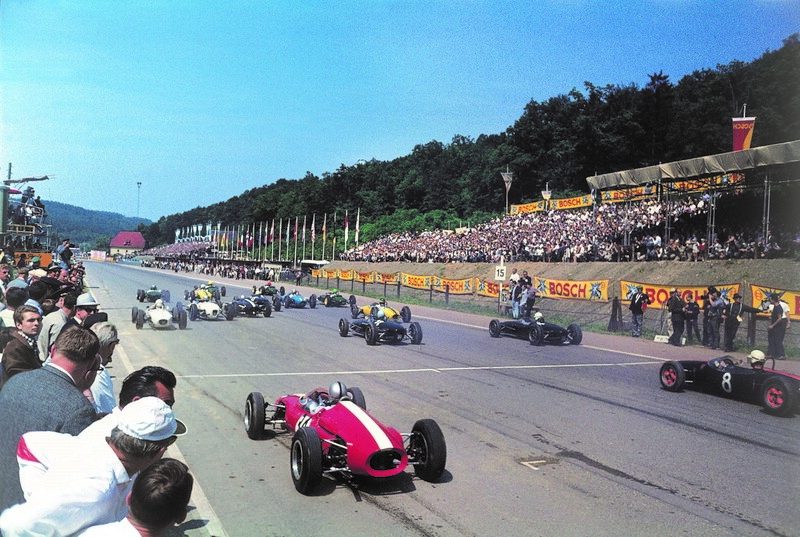 Jean-Claude Franck won with his car at the Brenau circuit near Berlin, which actually involved a section of autobahn carriageways and even part of the slip entry/exit junction system !. 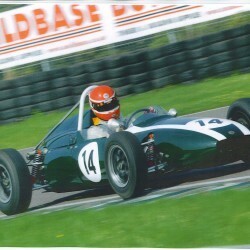 Peter and Doug Revson each bought a car and Peter won and led home 4 other Coopers at the Roskilde circuit in Denmark. John Rhodes and Peter Proctor were the regulars, relieved on occasion by Tim Mayer and also by Jose Rosinski who won at Magny Cours. The Ahrens car, both of the Revson cars and Francks’ car are amongst the ten cars known today. 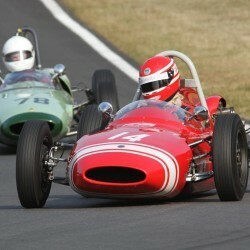 Chassis FJ/15/63 is the prototype Cooper Car Company Limited 1963 Formula Junior. Only one T65 ( FJ MK IV ) was built and formed the basis for the production cars known as T67’s. 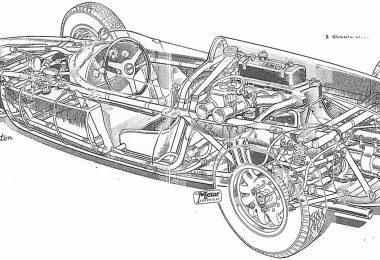 Chassis FJ/15/63 also known as the “Hydro Proto” and featured in the February 1963 Autosport Article with a Theo Page cutaway drawing, was shown at the 1963 Motor Show fitted with Hydrolastic suspension. This proved unsuitable and the car was converted to coil springs. 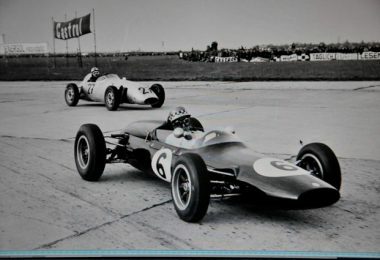 Run as one of three works Tyrrell Car’s in 1963, driven by, amongst others, Timmy Mayer, Peter Proctor and John Rhodes, FJ/15/63 was returned to the works at the end of the 1963 season and allocated its chassis plate. 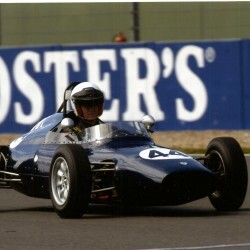 The car was then sold by the works to David Porter who ran Trevor Shatwell under the Flairavia Racing banner in International F3 in 1964. The car was then purchased by P.A.B.Stewart from Fife in 1965 who raced, hill climbed and sprinted FJ/15/63 until 1970 under the Caledonian Motors banner. 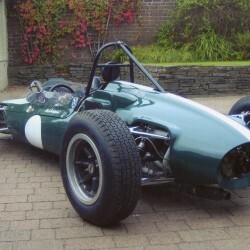 The car was then acquired by Ian Mackenzie then laid up until purchased in dis- assembled state by George Cooper in 2007. George reassembled the car but did not compete with it. I purchased the car from George Cooper in June 2009 and since then have been developing it, the major change being the finding of the original 6 speed Jack Knight ERSA gearbox in Brisbane. 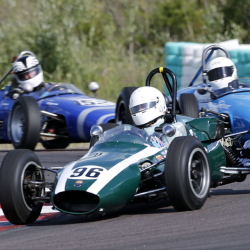 Since acquisition Chassis FJ/15/63 has competed at Bo’ness, Doune, Prescott, Shelsley Walsh and Vernasca Hill Climbs and been raced widely in Europe, New Zealand and the USA. 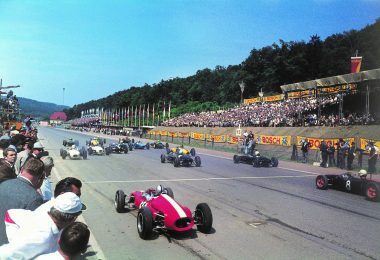 Major events entered include Laguna Seca, Goodwood and Monza. The T65 won the E2 class of the Lurani Championship in 2014, 2015 and 2016. Engine BMC-XSP. 67.6mm bore x 76.2mm stroke, capacity 1095cc. alternative ratio final drive drop gears. 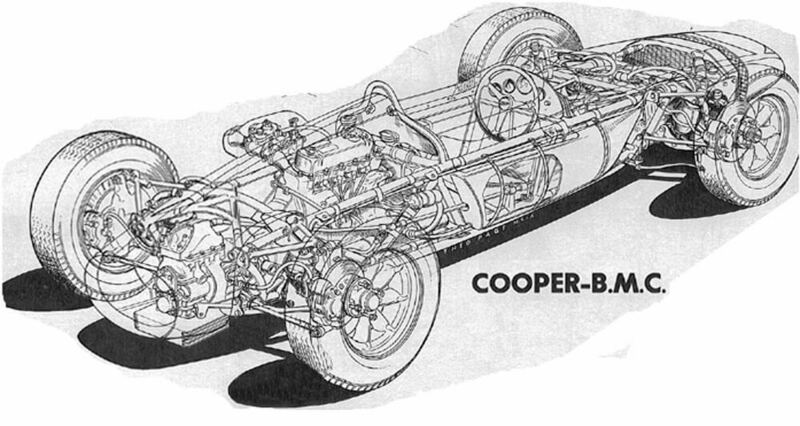 This model was the first Cooper Formula Junior to use disc brakes as standard and the callipers were Mini-Cooper. Although the factory continued to use some off the shelf components where practicable more and more items were bespoke, indicating a high level of financial commitment to this formula. 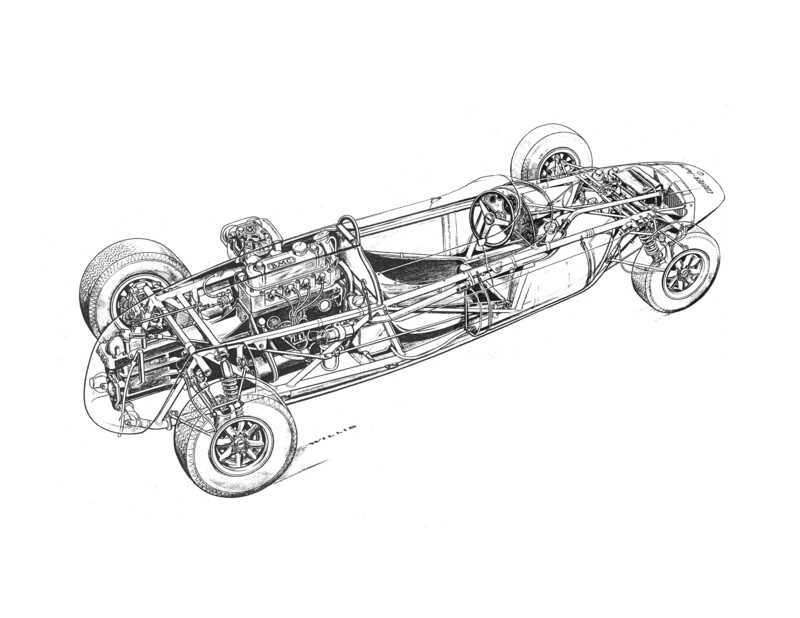 The improved chassis was narrower & better braced, the wishbones were longer and the body reduced in width & height. 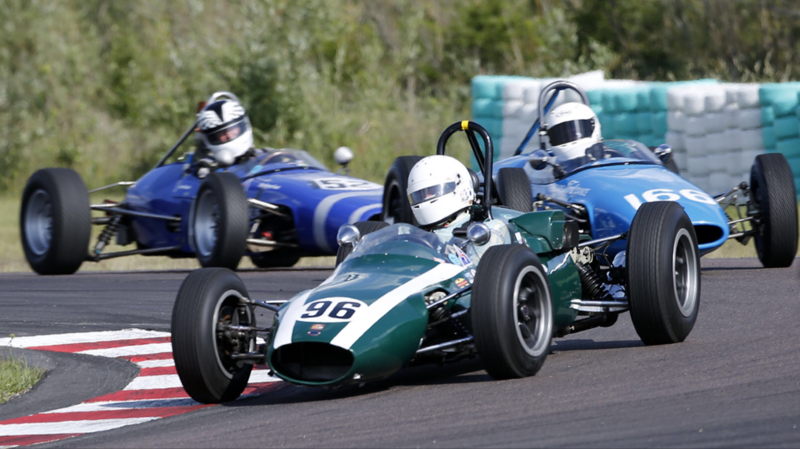 John Love & Tony Maggs continued as the “Cooper Twins” for another year using BMC engines in their Works Team cars, run once again by the Tyrrell Racing Organization. However the Ford was becoming very popular and a good many private teams and individuals opted for this engine, so the “twins” didn’t have it all their own way again this season. The standard gearbox reverted to the Jack Knight modified ERSA, now in 5 speed form, the previously unpopular Renault alternative for the Mk2 being dropped. Although MRP thinned a little overall, they continued to support the marque in some numbers and it fell to Richard Attwood to chalk up this model’s first victory, at Silverstone, the precursor to more than 30 race wins for numerous teams and privateers. The “twins” had some good wins individually on the continent, augmented by Denis Hulme on occasion and at Karlskoga they produced another of their set piece 1st & 2nd finishes. 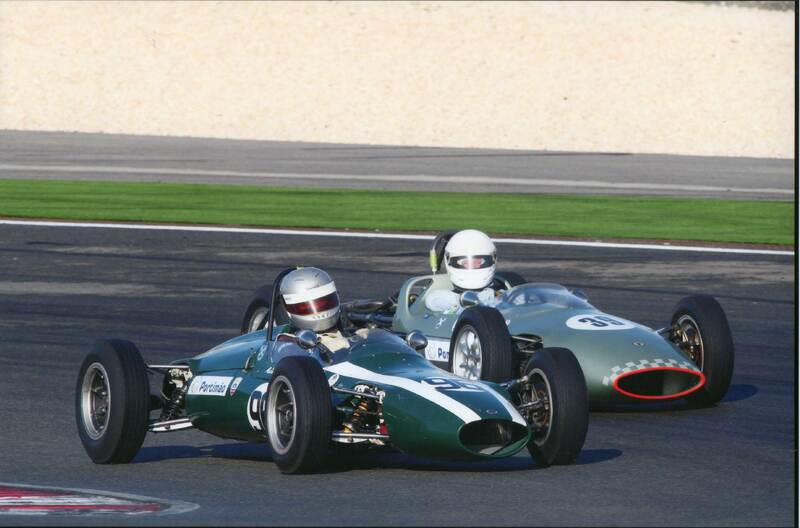 The 1962 season was very fruitful and more than once Mk3s were winning at three different circuits on the same day all across Europe. The USA was a very good market for this model and several famous figures, who had supported Coopers so far, continued with the Mk3. 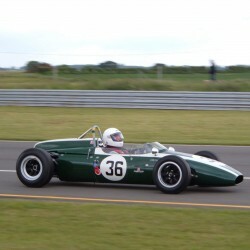 Tim Mayer did well, twice leading a 1-2-3 race finish and Walt Hansgen had some good wins in a Briggs Cunningham entered car, who raced his FIAT engined Mk2 Cooper himself sometimes. Another legend in his own lifetime who enjoyed racing the excellent Mk3 was Roger Penske. This highly regarded model sold to 11 different countries in 1962 and thirty two cars are known to survive today. Track 4’ front, 3’11” rear. Engine BMC-XSP. 64.4mm bore x 76.2mm stroke, capacity 994cc. Wet sump. Twin S.U. or Single twin-choke Weber carburettor. Brakes 8” radial fin cast magnesium drums. 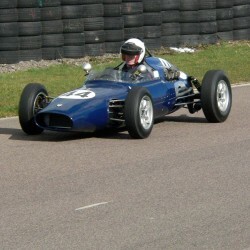 This second Formula Junior was designed to closely resemble the contemporary F1 model and the now predominantly straight tube chassis, just 2 inches shorter wheelbase than the F1 car, was clothed in a fibreglass body with a long nose & high tail fin and was the first Cooper to use 13” wheels. 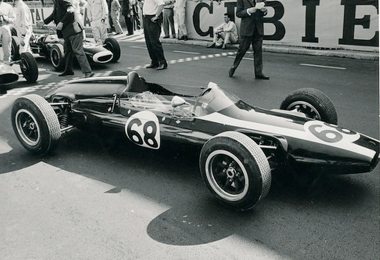 The final development & set up was overseen & tested by works GP driver Bruce McLaren. 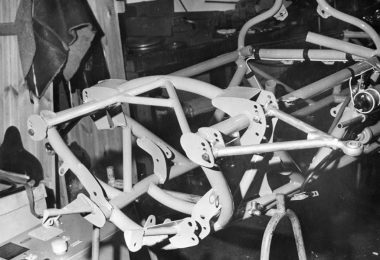 Suspension was coil springs & wishbones all round, retaining the previous uprights but now with brake drums separate from the wheels. BMC continued as the standard engine but some Ford Cosworths were fitted which had become available in 1098cc capacity and dry sump. Walt Hansgen was victorious in the models’ very first race, actually in November 1960, at Riverside, California in the prototype. Ricardo Rodriguez then won with this car in Mexico City, following which it featured in a motor racing B movie film, in which Ricardo was lead actor and the car was painted in Pepsi-Cola colours complete with large bottle top logos. 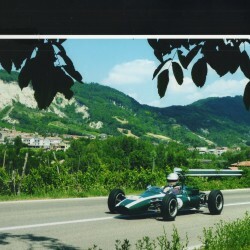 Future World Champion, New Zealander Denis Hulme raced a Mk2 several times and eventually won with his car Pescara. Nearer home, Tony Maggs and John Love were hugely successful, finishing 1st & 2nd together for the Works Team in over a dozen European races, sharing the laurels roughly equally and even staging a dead heat once at Montlhery, with Maggs winning the European FJ Championship. The Midland Racing Partnership team fielded up to five of this model and John Rhodes won a great many of the UK races for them. 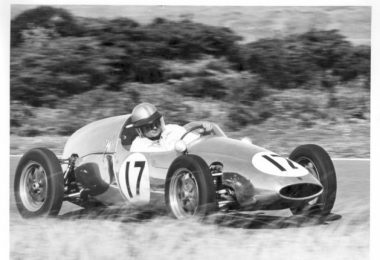 He went on to race Grand Prix Coopers and acquired the title “Smoking” Rhodes when he raced Mini-Coopers to equally good effect. On the strength of all this success the famous film actor and motorcycle racer Steve McQueen bought one of the works team cars at the end of the year. Thirty two cars are known to survive including Works Team cars, MRP cars and the Hansgen/Rodriguez car. bore 85mm x stroke 48mm, 1098cc, A6 camshaft, 9.0krpm, 110bhp. Transmission > Inverted VW transaxle, 4 speed close ratio gear cluster. Brakes > 8”dia x 1 ½”wide, iron lined cast magnesium drums. Wheelbase 89”, Track 48”, Weight 412kg. 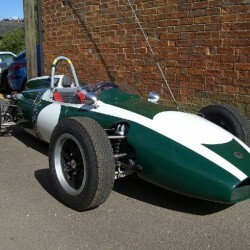 This car was originally one of the Cooper Works Team cars run by Ken Tyrrell, which were raced by John Love and Tony Maggs for the 1961 Formula Junior Championship season ~ won jointly by Maggs. In September 1961 the car was sold to Frenchman, Robert Bouharde and given chassis number FJ/21/61 by the works, for export purposes. 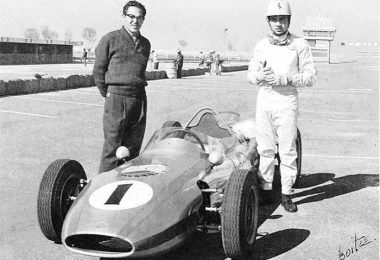 Bouharde raced the car extensively until Formula Junior ceased at the end of 1963, including winning the 1962 Coupe de Paris at Montlhery. In 1966 the original BMC engine was changed for a Ford and for 10 yrs was used for Sand Races, Hill Climbs & Sprints in Jersey, Channel Isles. Brian Moody won the 1967 Sand Racing Championship, Ching Trophy. A major restoration in 1978 included refitting a BMC engine, which survived until a catastrophic blow up in 1988 when the present Ford engine was fitted and the original gearbox was replaced by the VW. 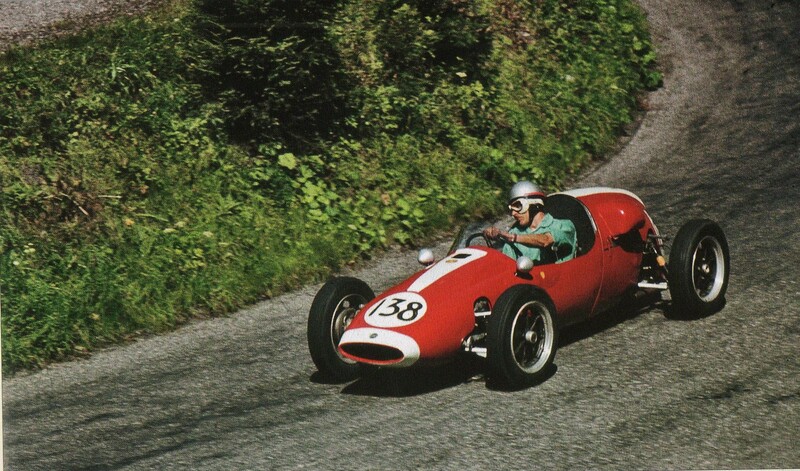 Some notable former owners include Tico Martini of Formula 1 fame and Roy Lane the British Hill Climb Champion. The car has been actively competitive for almost every year of its existence being campaigned all over Europe and also North Africa. The present owner enjoys continuing this fine tradition with mostly Historic Racing Championships, Hill Climbs and Sprints. 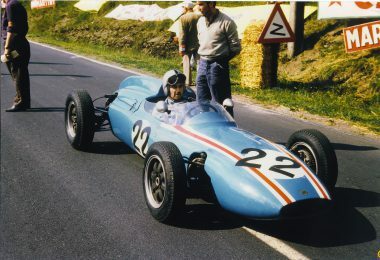 The car is presented in the French period livery of Robert Bouharde. 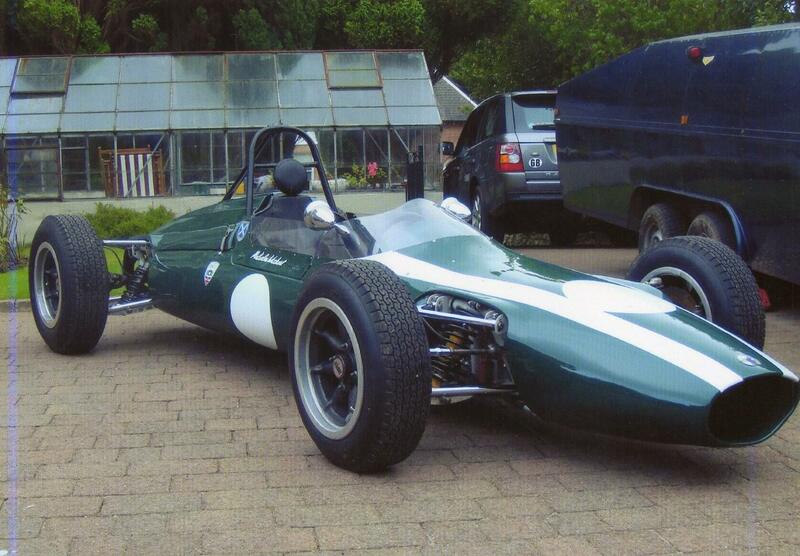 This car was originally one of the three Cooper BMC Works Team cars run by Ken Tyrrell. It was raced by both John Love and Tony Maggs* for the 1961 Formula Junior Championship season and they were hugely successful, finishing 1st & 2nd together for the Works Team in over a dozen European races, sharing the laurels roughly equally and even staging a dead heat once at Montlhery. The car was sold to an Australian buyer by David Rishworth in 1979 and later to the Valdez collection in the US from which I bought it in 2008. 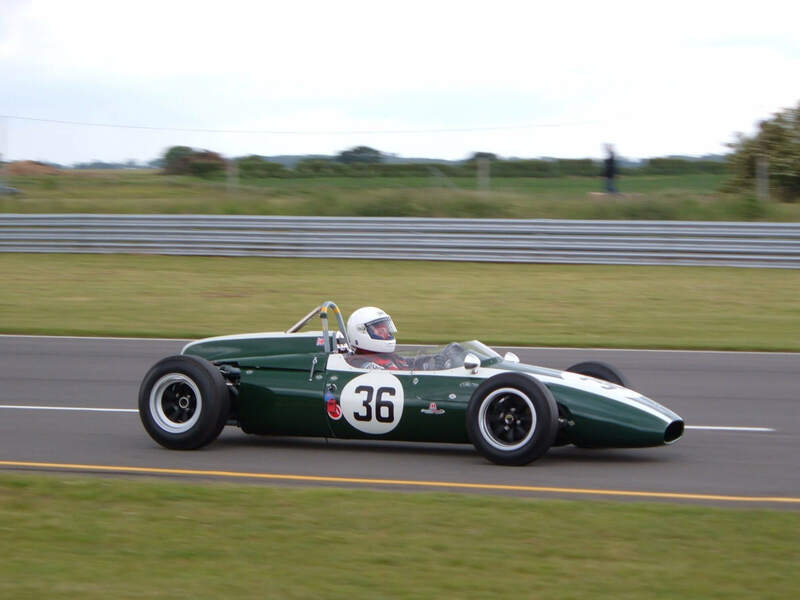 I re-imported it into the UK early in 2009 and finding it completely unraceworthy had it recommissioned.I then debuted it at the John Taylor trophy race at Mallory Park and winning the class by 6 hundredth’s of a second as the engine was in the process of letting go ! 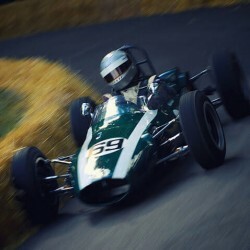 John Love came very close to becoming the first African driver to win a World Championship Grand Prix in 1967 when driving an ex- Bruce Mclaren Cooper in the South African Grand Prix at Kylami.Love had been a leading local driver for many years and at 42 was relatively old for a Grand Prix driver. 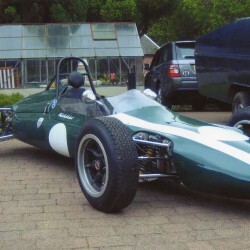 Eighteen months earlier he had acquired Cooper T79 with a Climax four-cylinder engine, which Bruce McLaren had raced in the 1965 Tasman series, winning the Australian GP at Longford. Engine BMC-XSP, 64.4mm bore x 76.2mm stroke, capacity 994cc. Wet sump. Twin S.U. carburettors. Brakes 8” drums integral with wheels, hydraulic twin leading shoe. 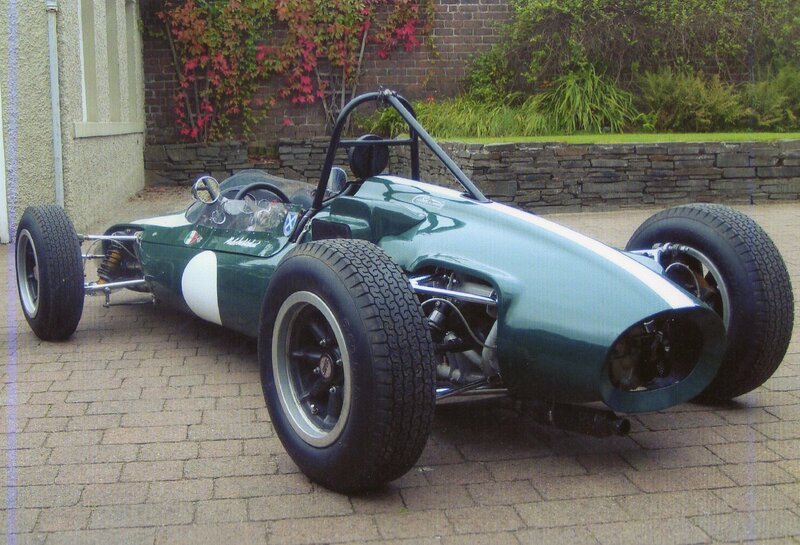 This model was Coopers first Formula Junior design and it drew heavily on parts from other models ~~ the 15” wheels came from the F3-500 cars whilst the gearbox, transverse rear leaf spring and cast magnesium uprights all came from F2. 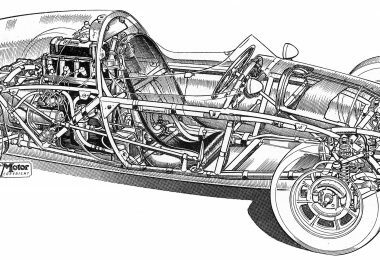 The chassis was a Cooper trademark all curved tube spaceframe and the aluminium body, typically simple to remove, was a nicely proportioned whale back style. 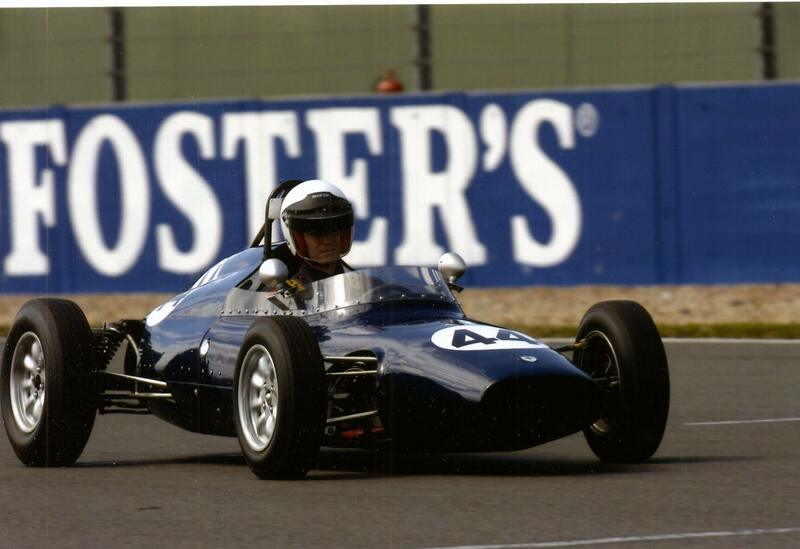 Front suspension was by double wishbones with coil springs and hydraulic telescopic dampers were fitted all round. 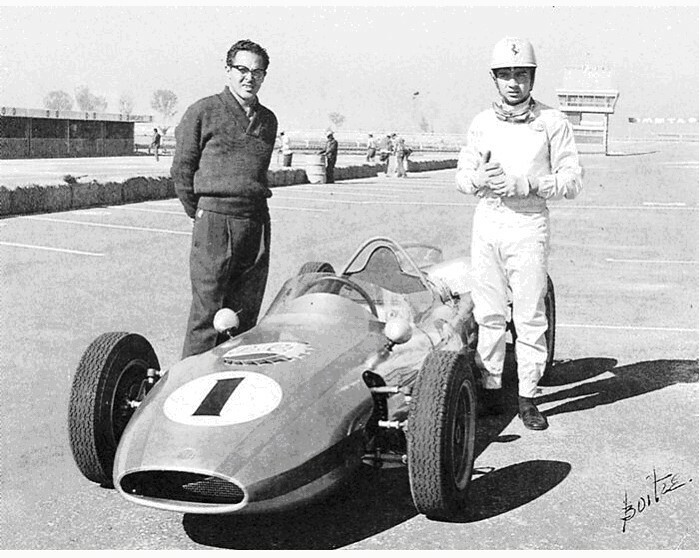 BMC engines were the factory standard but other makes such as FIAT, Lancia & DKW were fitted and a few cars had the newly developed Ford engine, including one which was raced by Jonathan Seiff of the Marks & Spencer family. He was to become MD of the Chipstead Group when they bought out the Cooper firm some years later. First race victory fell to the BMC engined car of Jack Dalton at Stockton, California and Kurt Ahrens’ FIAT powered example won at Trier in Germany just a few weeks later and he took 3 more victories including one at Dresden. 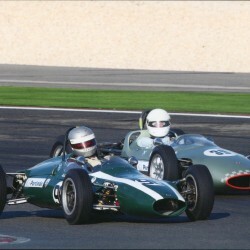 Henry Taylor won the prestigious Monaco Junior GP race and won again at Albi and then at Silverstone. 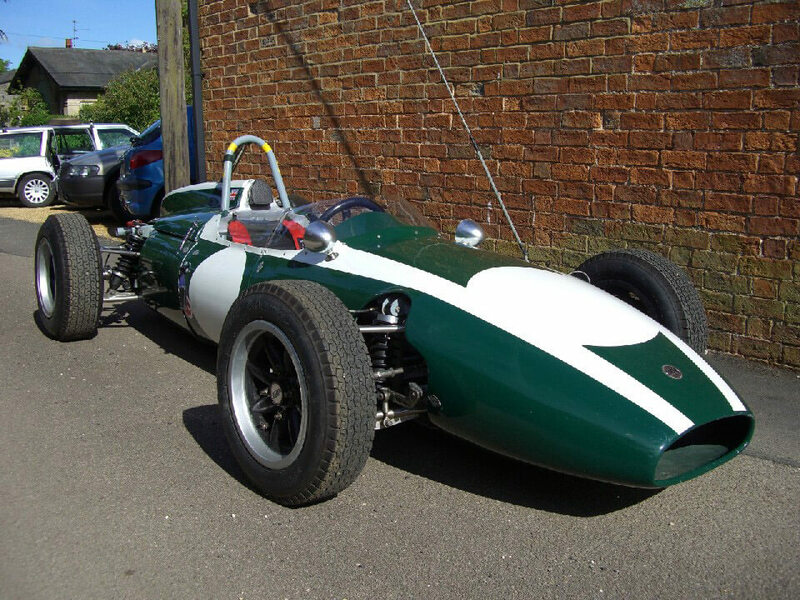 Notably John Surtees made his single seater debut in this model, finishing 2nd to Jim Clark at Goodwood and he went on to fame & fortune as the only man, so far, to be a World Champion racing cars and motorcycles. Rising star Mike Spence won two races in England and Walt Hansgen a similar number in USA, driving Briggs Cunningham’s car. The Lancia engined car is one of the eighteen cars known today. 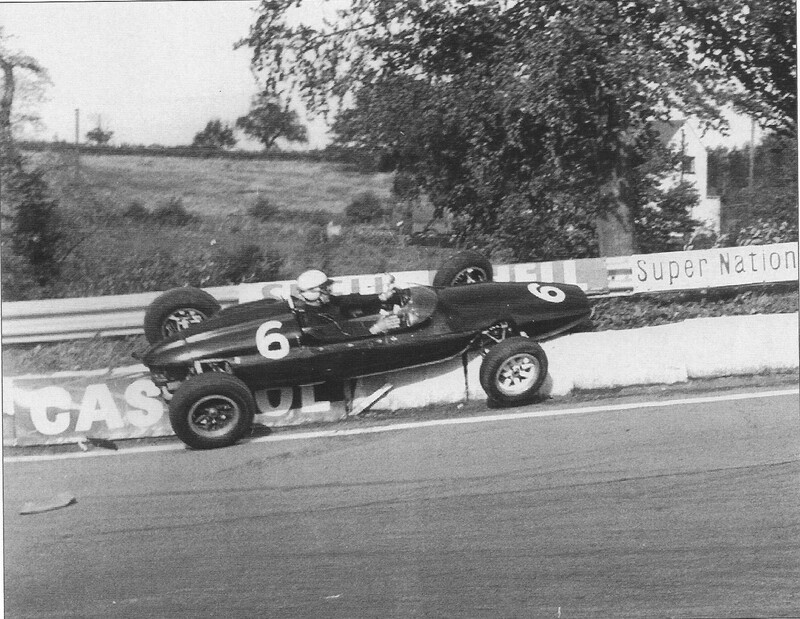 Andre Periat hillclimbing at Schausinland, Germany.